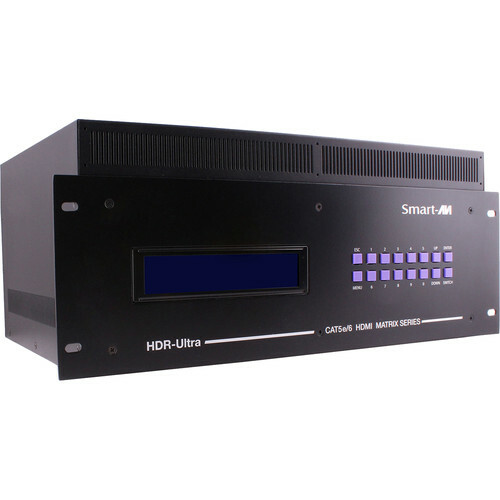 The HDR8x4-ULTRA Expandable HDMI 8 x 4 Matrix Switcher from Smart-AVI is a high-definition video router that enables you to route HD 1080p content, multi-channel audio, and IR signals up to 425’ over a single CAT5/5e/6 cable, providing a solution to create a clean and efficient video and digital signage system. Thanks to the CAT5e/6 connection, the HDR8x8-ULTRA allows the operator to remotely switch the source as well as control the input sources. This allows for routing and viewing in applications such as home entertainment, digital signage, medical systems, live events, etc. The matrix switcher features 8 input and 8 output card slots. Each input card has 2 HDMI ports and each output card has 2 RJ45 ports. This unit comes with 2 input and 2 output cards that provide a total of 8 HDMI inputs and 4 RJ45 outputs. Additional input/output cards (not included) can be installed to expand the capability to 16 x 16. At each display end, the HDX-Ultra-RX (not included) receives the HDMI, IR, and RS-232 output signals. The HDMI signals are fed to the HDMI-capable display via an HDMI cable. The HDX-Ultra-RX also features an RS-232 port to output control signals. Each video input of the HDR8x4-ULTRA incorporates SmartEDID programmable technology that makes it capable of learning video resolutions, audio settings, and 3D data. The EDID memory of each display is stored in a single flash memory, giving you freedom to choose any EDID and emulation for any display. EDID management allows learning and saving the attributes including audio of up to 100 displays. With support for HDMI 1.4, HDCP, HDR8x4-ULTRA can learn EDID from virtually any display device connected. You can locally switch between sources without the use of any software via the easy-to-operate front panel, or remotely through an RS-232, IR, or TCP/IP connection. The LCD (4 x 40) displays detailed information about the status of the switch at any given moment. The included SmartControl software allows controlling the unit via an RS-232 connection. It enables users to control the matrix using the graphic user interface, without having to write the codes and send serial commands to the devices. The software enables configuration of the size and type of the matrix, including a preset defined at macro. In addition, it enables identification by name for each source and display. The HDR8x8-ULTRA can be controlled remotely using Smart-AVI’s remote control solution (sold separately). It allows assigning inputs, outputs, and controlling routing functions. In addition, it can also control the video inputs. Sources like cable TV, DVD players, and others can be selected on the matrix switcher and then adjusted. It all happens with the same remote and without the need to run any new cables. The Net-IP-Pro Module (sold separately) enables multiple users to control and configure the matrix from virtually anywhere in the world using a Web browser. It also supports Telnet for integration with other control systems. Note: The remote control solution requires SRC-2A IR Remote Control, IR-EYE IR receiver, and Smart IR Blaster, all sold separately.